Someone typed “my golfball goldfish won’t eat” and found his / her way to theloveculture. I know the panic the goldfish lover must be feeling. I know the desperation of not knowing what to do and who to go to for help. As a last measure, J drove up to a clinic to see a vet about our goldfish. The doctor actually laughed at him when he said our goldfish was sick and needed meds. It’s true most people rarely take goldfish seriously as a pet. They even joke that if one dies, just get another. They don’t realise that every goldfish is unique and irreplaceable. They are not only intelligent, sentient beings with good memories. They are super playful, lovable, and have a strong mind of their own. We got the idea of making swimming hoops by observing Patches’s way of playing with the tubings sticking out of his quarantine tub. He’d head-bang the tubes until it formed a circular loop, swim through it and make a round. By the time he’s back, the tubes would be back to its original position. He’d push at it again till it gives way and forms a circle, shoot right through it, then repeat, till he’s bored of it. I’ve also observed my goldfish trying to communicate to me, using body language. After a while, though they can’t speak or bark or make any audible sounds, you can learn to ‘hear’ what they’re saying, simply by observing the way they’re being when they see you. They say A LOT. The thing is, I met an amazing man last Friday. He is a retired army guy, and is now in the business of goldfish. He’s in it for the passion. He knows so much about goldfish and how to treat them when they’re sick. I wish I met him years ago. He might’ve been able to help me save my chubs. And the thing is, it’s never too late to start. I just got the idea of interviewing him and featuring him on my site. We can learn so much from him, and the wonderful thing is that he is willing to share what he knows, with us. This solves the mystery! 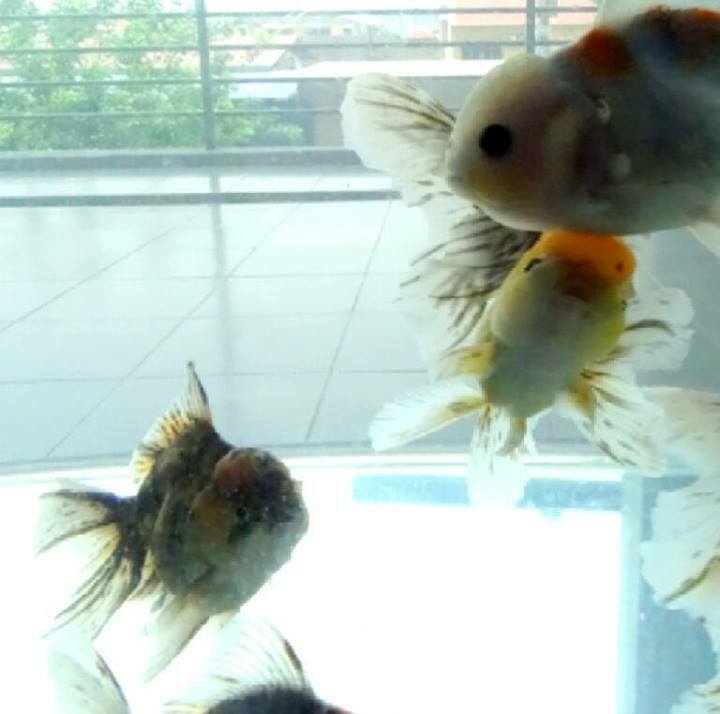 There are quite a few goldfish owners panicking in forums, wondering why their black goldfish had become a “common orange” colour. They’re guessing that maybe the goldfish didn’t get enough sunlight so the colour is “fading”. Or that something’s wrong with the food or water. If only they knew they have a magical APACHE in their hands and that it’s genetics! They’d freak out less and celebrate! Anyways. I like this idea of interviewing the goldfish man and learning how to take better care of our goldfish. The fancy ones are able to live 9 – 12 years, and the wild ones are known to live up to 30 years. Let’s not allow our unintentional ignorance to cut short their wonderful years. Let’s help each other take better care of our goldfish. If you’re a goldfish lover and you’ve got some questions to ask / tips to share, please leave a comment here below. 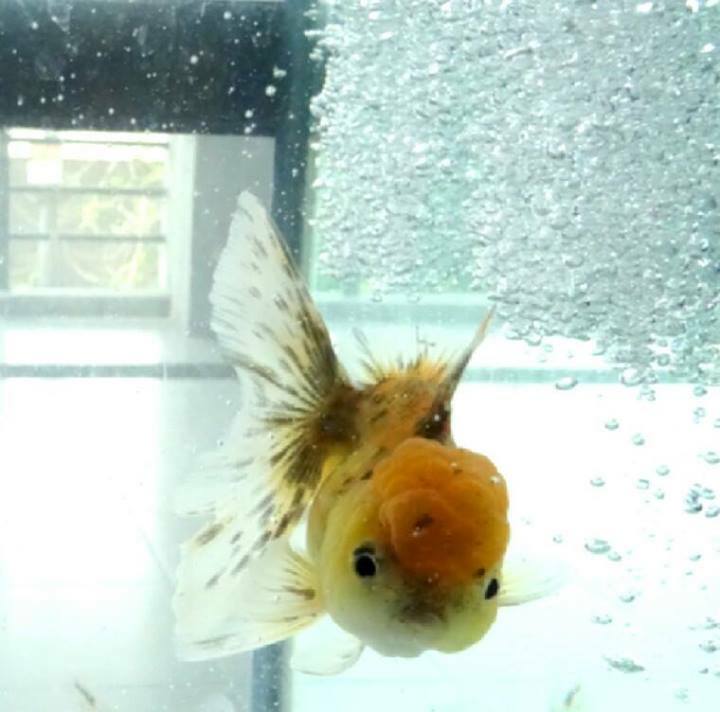 Here are pictures of a goldfish I fell in love with, last week, at his shop. I call him PEPPPER, cos he has a speckle of freckles like pepper across his cheeks. Also, all my goldfish have names beginning with P. No reason why, it just started off that way and will stay that way, as a tradition, and just for fun.